OCASI created Etablissement.Org with funding from Immigration, Refugees and Citizenship Canada (IRCC) and the Ontario Ministry of Citizenship and Immigration. 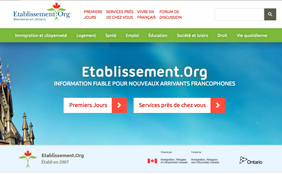 Etablissement.Org is an information and referral French language website to help and address the needs of French-speaking newcomers (and potential newcomers) to Ontario. Etablissement.Org has a Discussion Forum that continues to be, statistically, one of the most popular area of the site. The most popular topics include questions about permanent residency, sponsorship, profession and employment related inquiries. In 2011 we launched the redesign of Etablissement.Org. The new look highlights content specific to Francophone communities. New sections and sub-sections have been created that discuss topics like, Working in French in Ontario, About French Ontario, Reality of bilingualism, Finding French care in French, French school boards and French schools, Rights of francophone in Ontario and much more.